JUice diet or Juice Fast as they call it, enjoy!! 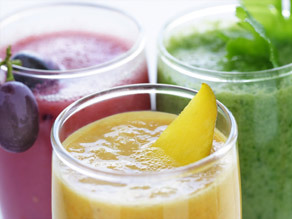 Fresh fruit and vegetable juices provide the body with a rich source of antioxidants. The benefit of drinking these fresh juices instead of eating the fruit or vegetables themselves, is that the juice doesn't require digestive energy like that required when eating fiber rich whole fruits or vegetables. This frees up the body's energy to use the nutrients for healing. Along with all this great nutrition, fresh juices are also low in calorie which often leads to weight loss. The advantage to following a juice fast, though, is that it still provides a full spectrum of nutrients to your body. Juice recipes are as limitless as all the fruits and vegetables you have at your finger tips.